If you’re not grinding your weed, you probably should be. Aside from the fact that you can break down your buds evenly while saving time and energy, grinders can also double as storage and catch kief, the collected trichomes that contain many cannabinoids. Packing a bowl with ground flower also makes for a cleaner and more even burn – the same goes for rolling joints, too! If you don’t have a grinder or just simply feel like it’s time for an upgrade, we’ve picked a few of the top options on the market to help you find just what you’re looking for. Space Case grinders have been around for a long time – and for good reason. Frequently mentioned as one of the best American-made grinders, they are loved for their quality materials, performance and design. Made with top of the line aerospace aluminum, Space Case grinders are strong, durable and won’t get banged up easily. There have even been stories of people owning Space Cases for 15 years and up! Plus, they’re really lightweight, fit great in your hand, and have sharp teeth that make for perfect herb shredding. Space Case also includes nylon O-rings in their design, making for a smooth grind that is particularly easier for people with arthritis or injuries. Space Case grinders come in small, medium and large sizes in a variety of finishes. Check one out today to see why they’re so popular! Click here to browse Space Case products. Considered one of the best grinders on the market, SharpStone is famous for its innovation. Made of heavy duty aircraft billet aluminum, their grinders come in several sizes, pieces and colors. SharpStone has magnetic lids and sharp, durable diamond teeth that make for a very fine grind. They also have features for people who have a hard time using their hands, like Teflon O-rings for easier twisting and a grinder with a crank mechanism on top. Check out more SharpStone grinders here. California-based Cali Crusher has been in the grinder business since 2010 and have established themselves as a go-to company for their huge variety of colors, models and prices. Made from anodized aluminum, Cali Crushers have extra sharp teeth that keep the grinder in top form, and feature hard tops, clear tops and crank grinders. Their Homegrown line is designed and manufactured in the U.S.A., unlike their other lines which are manufactured in China. 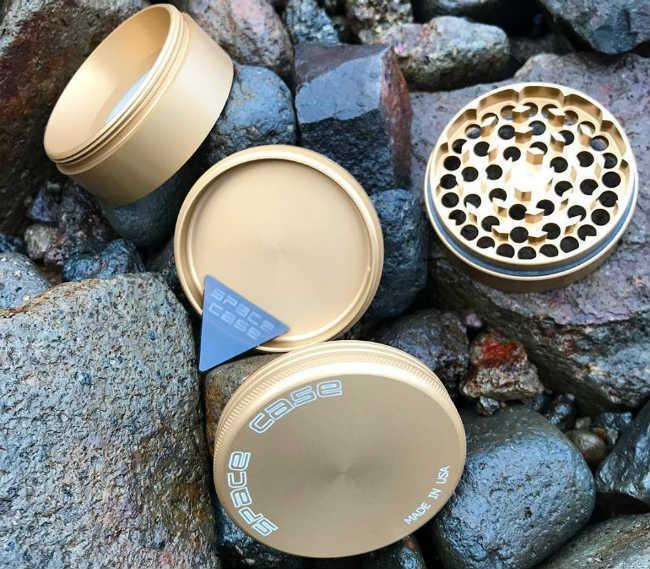 Click here to view more Cali Crusher grinders. Billing themselves as the “Medical Grade Standard,” Phoenician grinders are sourced and made in the U.S.A. and are especially good options for medical patients. Coming in both two and four piece models, they have a knurl grip, allowing arthritic or injured hands an easier twist. Another distinctive element is the decreased tooth amount, allowing room for more herb and a smoother grind. Phoenician grinders also feature a pollen screen that can be removed and replaced, allowing for easy cleaning. For a splurge, the Elite Series are glazed in 24-karat gold and chrome. Check out all the Phoenician grinder products here. What sets Kannastör grinders apart from its competitors is the GR8TR line. With eight distinct pieces, the screens are removable and the grinder plates can be changed, making it simple to make both coarse and fine cuts. Kannastör is similar to other grinders in terms of capability and durability, but they have a lot of product options, including the GR8TR, multi-chamber, and single chamber lines. With a limited lifetime warranty, they’ll cover you, even for normal wear and tear. Browse all Kannastör grinders by clicking here. If you’re looking for variety, affordability, and a lifetime warranty you should take a look at Zip Grinders. They have several options, including the Mega Crusher, the Asian-inspired Pagoda Tower and a few designer lids featuring artistic imagery. The Mega Crusher has an extra-large storage chamber and can hold up to six tablespoons of flower, making it doubly handy as both a grinder and storage container. Click here to view more Zip Grinders. California’s Santa Cruz Shredder is making waves. Utilizing Siemens CAD Software, they’ve patented a “perfect” shredding tooth design. Leaving “sharper is better” behind, they’ve focused on strength that won’t dull. The teeth cut multiple ways, the idea being to “fluff to perfection.” Other features are a unique “7-Catch Design,” to easily adjoin grinder parts, and a knurled grip. Santa Cruz is the only grinder with strict “Medical-Grade Ultrasonic Cleansing procedures,” which removes all traces of contaminants like dust, dirt, and toxic oils and polish. Santa Cruz guarantees the Shredder is the only medical-grade grinder in the world (although Phoenician Engineering may argue that claim). View more Santa Cruz Shredder grinders here. BestGrinder.net called Black Tie “the best weed grinder we’ve ever reviewed.” At Black Tie, they use the highest grade of super durable anodized aluminum, a micron mesh sifter and neodymium magnets. The grinders are manufactured using CNC machines, and feature 50 diamond-shaped teeth for an excellent grind. Their companion piece designed specifically for women, the Pink Bow Grinder, comes in, well, pink. Black Tie also has a 100 percent money back guarantee, no questions asked. Check out all of Black Tie Grinder’s products by clicking here. Mendo Mulchers, made in Mendocino, California, have been in the grinder business for 20 years. Mendo grinders have more than 88 teeth, about twice the typical grinder, and they’re made from billet aluminum on a CNC machine for design precision. The high-quality aluminum keeps the grinder in top shape, has a metallic finish that prevents fingerprints and scratches, and offers a full lifetime warranty. Mendo is known for its superior quality and fine grind, making it perfect for vaporizing or rolling joints and blunts. Click here to browse Mendo Mulcher grinders. What’s your favorite cannabis grinder? Share your thoughts in the comments below! Does Consuming Cannabis Affect Your Memory? How Long Should You Heat Your Nail or Banger Before a Dab?